Sigyn has outdone herself this year. With her toga, sandals, bow, and doggish companion, she is the spitting image of the Midgardian deity Diana, Goddess of the Hunt. You are beautiful, darling, and my goddess any day of the year. Sigyn is going to be quite surprised to see my get-up. You see, after Sigyn and I talked over the whole “Steve” business, I paid the All-American Man With a Plan a little visit, just to prove there are were no hard feelings. Perhaps, Sigyn, you prefer your new companion, given that you seem to like him so much. Sigyn and I did not carve pumpkins last year. We were too busy and couldn’t think of anything to top the previous year’s perforated pepos. This year, we feel the urge to do a little gourd-gouging. There are some intriguing prospects at the market. Yes, dearest, that is a fine pumpkin! But it’s a bit…big. I think you would probably be still be carving next Halloween. Now this one looks properly hideous and ghoulish. Whack in a couple of eye-holes in this pumpy lumpkin and bam! Instant Quasimodo. The human female however, is in no mood to deal with vast quantities of pumpkin guts and has procured us somewhat smaller vegetable specimens, as well as paper for planning our designs. Sigyn has something cheerful in mind. …so we are all set. Let the pumpkin perforating begin! Our last stop today is the spice merchant the humans are fond of visiting. Sigyn and I have been here before. …and the really good stuff. Careful, beloved! If you fall in, they will probably not let us come back. There are other delights as well, though I think the name on this one is made up. Sigyn is fond of cherries in any form, so I think I will buy her a jar. I’m just not letting her near the empty jars, because, well, we know what happens when Sigyn meets glassware. No! Sigyn! Stop. Come away from the jars, dearest. Um…Salt! I have an urgent need to look at the, uh, salt on the other side of the store. Look at all the salt! White salt. Gray salt. Pink salt! The salesperson at the counter says she has been dealing with crazy customers today, even before the human female came in. I think I will continue the fun by asking her if she has any organic, gluten-free, vegan, locally-produced Himalayan sea salt. Just to watch her eye twitch. We have moved on to a–to use the human female’s stupid word–“ginormous” art supply store. Sigyn is quite artistic, and she is entranced by the aisles and aisles of paints, pens, pencils, paper, and other goods, some of which do not begin with the letter P. The human female and the blue-haired god-daughter are grabbing handfuls of things and moaning over the expensive colored pencils sets and tubes of watercolors. It appears that the store has a fair number of toys and trinkets, in addition to canvas, gesso, and sketchbooks. Sigyn has left the gold leaf and bone folders and made the acquaintance of some friendly mice. Careful, love. I thik that one on the right may be an R.O.U.S. 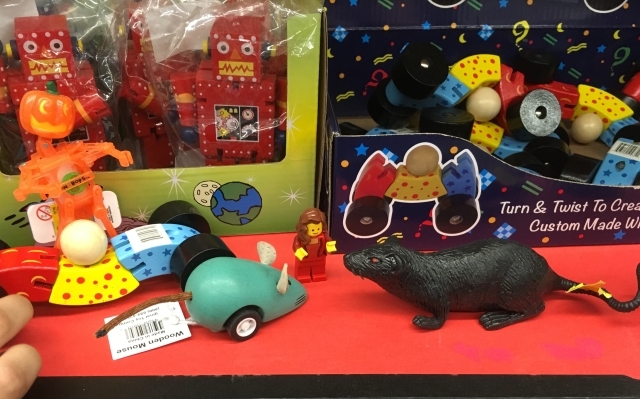 and not an actual mouse. And that pumpkin-headed fellow does not look as if he has your best interests at heart. This fellow looks a little friendlier. You would think that the humans had eaten as much as they possibly could, but no! The human female and the blue-haired god-daughter have decided to take advantage of this rare trip to the Big City to the South to try out a highly-touted pastry shop. Let us join them, Sigyn. There is always room for puff pastry. It’s a very fancy, Frenchy bakery. Even the little buildings on the tray have teeny little French signs. The human female, while tempted by the almond cake with apricots or pears, has opted for something she calls “stroodle.” That sounds like plumbing backing up! The blue-haired god-daughter is endeavoring to eat a cream puff roughly the size of her fist. It’s very squishy. I don’t know whether to help her eat it or to just flop on it and have a bit of a postprandial nap. The human male and the friends have ended up down the street in the premises of the Purveyor of Pens and we have now joined them. The human male is looking for inks and the female is just poking. I am still looking for the perfect green ink. Sigyn, of course, wants red. Ehehehehehe! Some of the ink and pen-cleaner labels are miniature works of art. Volstagg’s triple chin! Look! The friendly proprietors have set out pizza, cake, and some wildly decorated doughnuts! Ehehehehe–the human female has tried a cute little fountain pen–and I made it leak on her! Yes, we’ve been here before, and yes, the human female has come away with inky fingers before, but it still makes me giggle every time. It appears that the humans are not going to be doing anything new today. We had been to the murderous bookstore before, and we are eating at a restaurant at which we have previously dined. The human female is tediously predictable and has ordered the same meal as she had before. The male, however, is eating one bao full of curry and one full of something called “pork katsu.” The Knittery Friend is having duck… And of course, we have the fries with the Korean beefy bits. They are imperative! Sigyn just can’t wait to dive right in. (But then, she likes cilantro more than I do…) This really is fusion food–aspects of cuisine from various parts of Midgard. I wonder what Midgardian-Asgardian fusion food would be like? Probably awful–roast venison with peanut butter. Mead-and-ice cream floats. <shudder> Let us contemplate this no further. Dessert! We have not had dessert here before, but the Knittery Friend has ordered some. 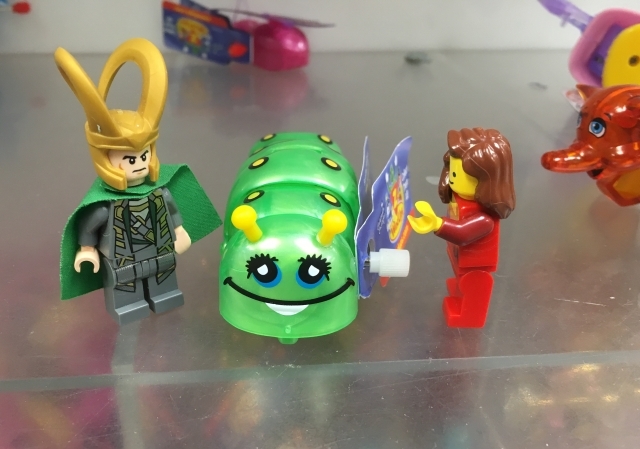 What on Midgard is this? Nibble, nibble, NOM NOM NOM. This is the same poofy dough, fried and drizzle-dusted with honey, cinnamon, and sugar. And something vaguely salty, which makes me want to eat the entire order. The way the human female is shoveling them in, though–I’m going to have to fight her for them! Time to waddle to our next destination. By Thor’s hefty hangovers! What vile apparition is this? I have not imbibed a drop today, but I seem to be having hallucinations nonetheless. Preposterous pink pachyderms! No! Sigyn! Come back–it can’t possibly be safe. Yes, I see now that it is street “art.” No, I will not sit on it with you. It is beneath my dignity. This one’s all yours. Knowing that if they do not seize the opportunity to go now they will not get to go anywhere until the holidays, the humans have gathered up the blue-haired god-daughter and set out for the Big City to the South. Sigyn and I have tagged along, as such trips usually involve interesting things to see, as well as tasty edibles. We only have part of a single day–a friend will medicate the aged feline but the humans do not want to presume upon his kindness overmuch–so we must be methodical in our Pursuit of Fun. First stop: a bookstore. This is good. I approve of books. 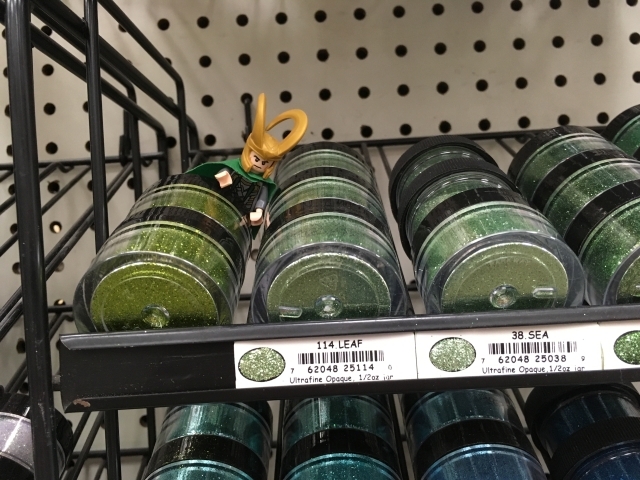 Most books in Asgard are full of sagas, tedious if they are about other people and not oneself, so I relish the chance to peruse Midgardian bookstores, which are full of all sorts of things. So many works! However shall I choose? Sigyn, are you doing all right? Sometimes she is a bit disturbed by the titles and cover art. I agree, Sigyn–the cheery yellow spine does make that title even more macabre. Oh, now this looks good! But what the…? Great Frigga’s hairpins! Can’t I go anywhere without being reminded of my wretched family? Ugh! That my monomaniacal, monocular father and my oafish ersatz-sibling also merit volumes robs me of all the pleasure of having a book of my own. I’m switching shelves. Augh! More over here! My damn family is everywhere! Let me try the other side of the shop. This looks promising! I have read some tales by this Gaiman fellow. The inside of his head is a delightfully spooky place. Oh, but this doesn’t bode well. Let us hope that bookstore-browsing is not a reliable form of augury. How worried should I be? Hmmm, there is a bird on the cover. Perhaps it deals with the downfall of Odin! Yes, that is a much more cheerful thought! It is a raven and Odin’s days are numbered!